Eggs Benedict with Blender Hollandaise Sauce, perfectly poached eggs, and savory ham is easy to make at home for your family or when feeding a crowd. Don’t be intimidated! It’s really not as hard as you might think. This delicious brunch recipe does not need to only be enjoyed in restaurants. Making a delicious Classic Eggs Benedict breakfast at home is much easier than you think, especially when you whirl up the hollandaise sauce in the blender. Breakfast is my favorite meal of the day. Some of my most popular recipes including Flaky Buttermilk Biscuits with Country Sausage Gravy as well as Granny’s Monkey Bread. I mean, what better way to start the morning than with a hot cup of coffee and a hearty or sweet recipe that puts a smile on your face? Eggs Benedict has always been a favorite of mine. I can’t begin to tell you how disappointed I am when I order Eggs Benedict at a restaurant and it doesn’t pass my standards. For this recipe to pass my test, the eggs have to be perfectly cooked, meaning the yolks are runny but the whites are cooked. The hollandaise sauce has to be not too thick, not too thin, with the perfect balance of lemon and butter. The ham has to be flavorful and slightly crispy without being dry. The English muffin must be perfect as well. I have very high standards for Eggs Benedict. That is probably why I adore this easy Eggs Benedict recipe. Seems like a weird question since I’ve been eating it my whole life, but I’m sure there are people out there who are not familiar with this classic breakfast recipe. 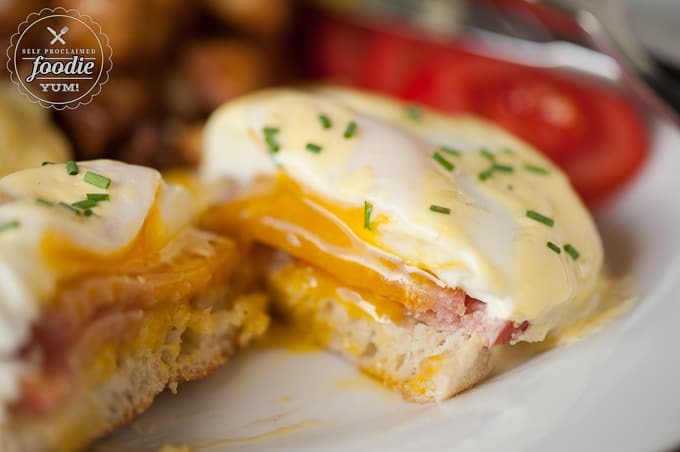 Eggs Benedict, aka Eggs Benny, is basically a breakfast that consists of an English muffin, ham, poached egg, and Hollandaise sauce all stacked together. Any idea where this dish originated? New York! A chef at the Waldorf Hotel made it for a man with the name of Benedict who happened to have a hangover and needed just the right breakfast. Do you know what goes into Hollandaise sauce? If you’ve never made it, you might not. I will tell you this – if you’re on a diet other than keto, you might not want to know. Hollandaise sauce consists of egg yolks, lemon juice, a dash of hot sauce, a bit of dijon mustard, and hot melted butter. Some people have a hard time eating eggs that arent’ fully cooked, but let me ask you this: Do you eat eggs that are over medium or fried where the yolks are runny? There’s really no difference. In my Hollandaise sauce recipe I recommend using unsalted butter and salt. This way you can control the salt content. I have a strong fondness for Kerrygold butter, however, which is salted and will often make my blender Hollandaise sauce with that and not add additional salt. I’m not ashamed to admit that the first time I tried to make traditional hollandaise by whisking the ingredients in a double boiler, I screwed it up royally. As in, it had to go straight into the garbage and I ran up to my room and cried for hours. Well, perhaps that was a slight exaggeration, but I did ruin it. Same goes for my first few attempts at a poached egg, which, I know now, is now super easy to make. Anyway, I found that it is actually super easy to “cheat” and make hollandaise in the blender or with an immersion blender. Someday I will try to make it in the double boiler again. Its on my lifetime bucket list, along with milking a cow and an Alaskan cruise. One note: This super easy Hollandaise sauce recipe makes enough for four people who have two eggs each. If you are complete gluttons when it comes to rich and decadent breakfasts like yours truly, go ahead and divide the hollandaise between just the two of you so you have something to swirl your breakfast potatoes in before shoveling them into your mouths. I won’t tell. Beyond the troublesome poached eggs and tricky hollandaise, challenge #3 was how to make this fattening yet delicious breakfast for a crowd. The reason I struggled was because it’s hard to cook a lot of poached eggs at the same time. Have no fear – I have the best method to being able to make this perfect eggs benedict recipe for a crowd. Simply toast the English muffins, only slightly, then place them on a baking sheet and top them with the Canadian bacon. Then, place them in a 200 degree F oven. Even if you can only make two poached eggs at a time, when you place them on the ham covered muffins, they will stay warm but will not continue to cook. If you’re worried about them cooking too much, you can always heat up the oven and turn it off as soon as you place the eggs in there. 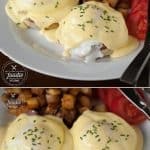 The main thing you want to keep in mind is that you want to serve the Eggs Benedict as soon as the blender Hollandaise sauce is made and poured on top. 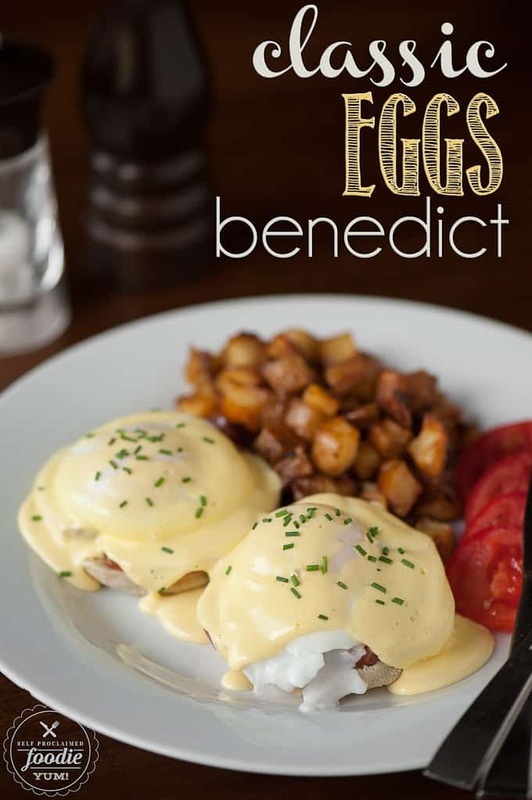 Ever go to a restaurant and see several different versions of Eggs Benedict? 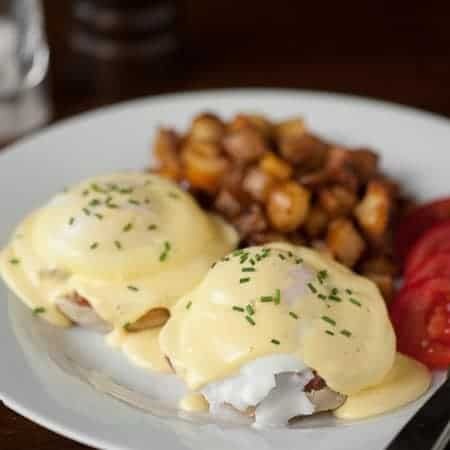 They pretty much all include an English muffin, poached egg, and Eggs Benedict sauce, or Hollandaise sauce. What varies is what else goes in. 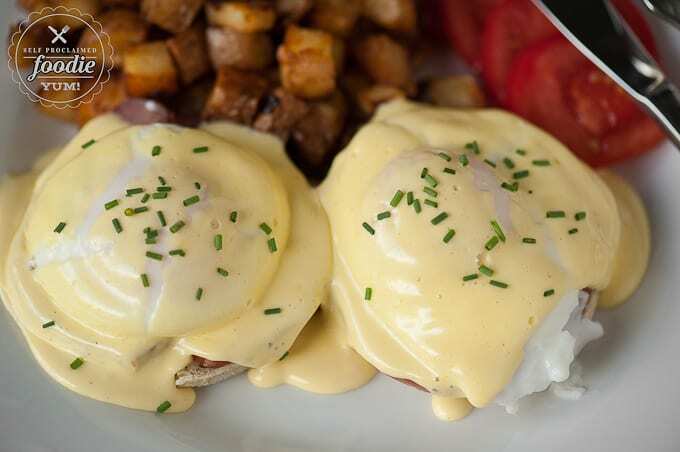 Popular here in the Pacific Northwest is Crab Benedict or Salmon Benedict where you replace the ham with wild seafood. YUM! Eggs Florentine substitutes wilted spinach for the ham or just adds it underneath. I love putting spinach on just about everything, expecially when decadent hollandaise sauce is involved. If you’re in California you could put avocado on your Eggs Benedict. Not sure if that’s a thing, but it sounds good, doesnt’ it? Preheat oven to 200 degrees F. Lightly toast English muffins. Arrange on baking sheet. Top with equal portions of Canadian bacon. Allow to stay warm in oven. Prepare poached eggs. If you are not able to make all 8 at the same time, do not worry. As the eggs finish, place each egg on top of the English muffin and Canadian bacon stack in the oven to stay warm. To make the hollandaise, add the egg yolks, dijon, lemon juice, and hot pepper sauce to the blender. Blend for only 5 seconds to combine. In a sauce pan over the stove or in a glass dish in the microwave, melt the butter until it is hot and bubbly. While the blender is running on low speed, pour in the hot butter in a thick steady stream. The hollandaise will thicken immediately. Do not over blend, otherwise your sauce will over thicken. As soon as all the butter is in, the sauce should be done. Add salt, if desired. Spoon equal portions of hollandaise over each egg. Garnish with minced chives or freshly ground pepper. Serve immediately. This post was originally created in September 2014 and has been updated with more fun facts and tidbits for your reading pleasure. Place butter into small microwave-safe bowl. Cover with wax paper and cook on high 1 1/2 minutes or until butter melts and is bubbly. Beat remaining ingredients in another small bowl, until smooth. Slowly add hot butter to egg-yolk mixture until smooth and slightly thickened, using a wire whisk. Microwave sauce at medium for 15 seconds. Stir with whisk. Cook 15 more seconds, stir with whisk. Until desired consistency. Serve over asparagus, eggs or chicken. This was an amazing recipe; so easy! Made this with the Bangin’ Breakfast Potatoes recipe. Can you make the hollandaise sauc a day in advance? I never have and wouldn’t recommend it. Eggs Benedict are definitely the best way to eat an egg or two, in my humble opinion at least. Lovely photos as well, that’s all I can think about eating right now. Is this safe to eat since your not cooking the egg? I definitely wouldn’t want anyone to take any chances when pregnant. I’ve always been the kind of person to eat obscene amounts of cookie dough, so eating raw egg has never bothered me nor has it made me sick. When I think of egg yolks, I think of runny egg yolks in over medium eggs. They truly aren’t cooked. If they were, they’d look like a hard boiled egg. Instead they’re just warm and runny. BUT, my advice to you would be that if you aren’t sure, don’t do it. My husband’s all-time favorite, so good! This is my husbands favorite breakfast item! Your recipe looks easy and delicious -thank you for sharing! This is hands down my favorite breakfast and your recipe looks fabulous! Can’t wait to try it! So yummy! The perfect weekend brunch recipe! Often times classic is BEST!! This is such a great recipe with really rich delicious flavor. The most amazing breakfast, seriously. Love how easy it was too. Getting ready to make this, but do you fry the bacon first? Not sure how to rate it yet. But it sounds good. Hi Bob, since I use ham I tend not to fry it because I don’t want it to dry out, but you definitely want it to get nice and warm!